PC Cast’s House of Night series debuted in 2007 with Marked, a novel that immediately caught the attention of vampire-fantasy fans worldwide. Part X-Men, part Twilight, and part Harry Potter, the House of Night series focuses on 16-year-old Zoey Redbird, who discovers she’s a fledgling vampyre and must leave her troubled family situation behind to attend the exclusive House of Night boarding school, while she completes the four-year “Change” into a full-fledged vampyre. There, she struggles to fit in with the other students, but while she makes fast friends with her roommate, Stevie Rae, she’s also thrust into a contentious rivalry with Aphrodite, the leader of the Dark Daughters. By the end of the first novel, it’s clear that Zoey isn’t a typical fledgling vampyre, which leads to more adventures–nine novels’ worth, to date–of both the supernatural and everyday teen nature. Cast, who writes with input from her daughter, Kristin Cast, crafts her books as both wish-fulfillment fantasies and relatable teen dramas, which has shot them to the top of the New York Times Best Sellers list. Now Cast is bringing House of Night to comics, with a little help from Dark Horse Comics, writer Kent Dalian, and artists Joëlle Jones (who is drawing the present-day storylines) and Karl Kerschl (handling flashbacks to the ancient vampyres). She made some time in her extremely busy schedule (did we mention the latest novel in the series, Destined, was just released last week?) so we could interview her for Dark Horse Month! Read on for the inside scoop, and make sure to check out a six-page preview of House of Night #1! TFAW.com: What made you want to bring House of Night to comics? PC Cast: I’ve been a fan of comics since I was a young girl. I was raised around a bunch (practically a herd) of boys and piles of comics. I loved them (the comics, not so much the herd of boys)! TFAW.com: Why did you choose Dark Horse Comics as the publisher? PC: Because DH has a reputation for respecting the integrity of the author and the author’s world vision. DH is also known for their incredible editorial team and the depth of artistic talent available to them. I am happy to report all of that is true about DH. Plus, if they’re good enough for Joss Whedon, they’re good enough for me! TFAW.com: How faithful will the comic-book series be to the books? PC: Very faithful. 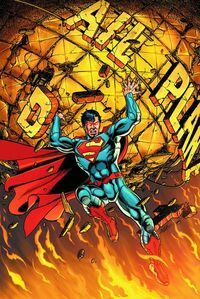 The first five comics are woven between the first books and the adapting author, Kent Dalian, and I took great pains to keep the comics true to the books. TFAW.com: What was it like seeing your stories in comic book form for the first time? What surprised you about the experience? PC: It was magick! I was surprised by the complexity of the process. There are soooo many steps! TFAW.com: How did you select Kent Dalian as the writer for the comics? PC: Kent and I worked together on a House of Night screenplay. He has also written the screenplay adaptation for one of my other novels, Goddess of the Rose, so I knew he could adapt my worlds, and I knew the depth of his talent. Actually, it was Kent who asked to try his hand at comics for me. I was happy to give him the reins! TFAW.com: Joëlle Jones, who previously worked on Janet Evanovich’s Troublemaker comics, was selected as the main House of Night artist. What was it about her style that made her the right choice? PC: She’s unique and has wonderful insight with the characters. And I just love her work! I have several of her prints (not HoN work) framed in my home, as does Kristin. We heart us some Joëlle! 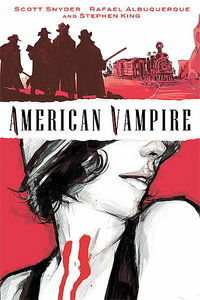 TFAW.com: The vampyres in House of Night are a little different than, say the vampires in Buffy or True Blood. Can you introduce them to new readers and reveal some of your influences? PC: First, my vampyres are matriarchal, which sets them apart from other vamp mythos. Though they do have paranormal influences in their lives, the actual event of Changing from teenage human to adult vampyre is biological, and their magick is grounded in the earth. Oh, and not all teenagers who are Marked and begin the biological Change live through it. TFAW.com: For a vampire tale, House of Night is grounded in some very relatable teen issues: Zoey Redbird, the protagonist, has problems with her stepfather and mother accepting that she’s a vampyre, and she later struggles with hiding things from her friends and the consequences. Does having your daughter, Kristin, as co-writer help keep things authentic? PC: Well, yes, but mostly Kristin acts as my teen voice/pop culture editor. I do the writing. I taught high school for 15 years. That’s why my kids and their problems are authentic, because I’m a teacher from a family of teachers and we understand teenagers. TFAW.com: I love that cats play such an instrumental role in the books. Where did that come from? PC: Historically cats have been vilified as familiars of “witches” and women in general. That’s just silliness and I like to dispel that kind of crap in my books. TFAW.com: You’ve just released Destined, the ninth House of Night novel. What was it like going back to the beginning with these characters for the comic? PC: Scary. I forget stuff! Thank Goddess for Kent! TFAW.com: Do you think you’ll do more comics after the first five issues? PC: Absolutely! Kent, Scott Allie, and I have already brainstormed a future HoN series we’re really excited about. It’s Top Secret right now, though. TFAW.com: Do you have an end point for the series? PC: Sorta. I have an end point for some of the main characters. I just have to figure out how to tie all the threads together. Clearly I need to drink more . . .
We want to thank Cast again for the fantastic interview! 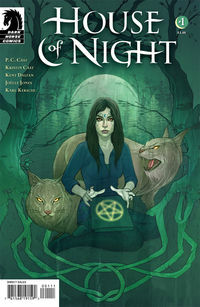 You can pre-order House of Night comics here at TFAW and save 20%–plus, issue #1 is just $.80. Pick it up today and see what all the fuss is about! Are you a House of Night fan? What’s it like seeing your favorite characters as comic-book characters? Post your comments below! We Review Every #1 Issue of The New 52! It’s our final week of DC’s The New 52 #1 reviews! Where did the time go? In this edition, we review all 13 of the September 28 #1 issues, including Aquaman #1, The Flash #1, Batman: The Dark Knight #1, Superman #1, Fury of Firestorm #1, Green Lantern New Guardians #1, Savage Hawkman #1, Teen Titans #1, All-Star Western #1, Blackhawks #1, I, Vampire #1, Justice League Dark #1, and Voodoo #1! We’ve divided all of these comics into three bite-sized videos, below. MILD SPOILER ALERT! We’ll avoid any big spoilers, but we will give out a few details as we go. So were these comics Box-Worthy, Fence-Worthy, or NOT Worthy? Listen to our opinions and then post your own below. Have you read any of DC’s The New 52 #1 issues yet? What did you think? Post your comments below! You can also pre-order The New 52 #2 and #3 issues now, too.